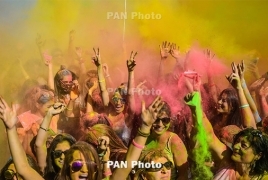 PanARMENIAN.Net - This year's edition of Yerevan Color Run marathon will be held in the Armenian capital on September 30, the organizers said in a Facebook event. The event is celebrating the 2800th anniversary of the foundation of Yerevan so those seeking to participate will have to run 2800 meters in total. The marathon which gathers youth and runners in the heart of the capital is set to last some three hours this year.